This article was written by Brooke Lowman, published on 24th October 2013 and has been read 3818 times. The speciality here is seafood. Being right next to the sea, it’s easy to see why. If you take a stroll down to the harbour area, you can witness many locals doing a spot of fishing off the quay. I even witnessed a lady who must have been in her 80s fishing with her husband. This brings me on to the next point, which doesn’t only apply to Vigo, but Spain in general… they are very good at catering for dietary requirements. Most supermarkets, even small ones, have food for people with dietary needs, and it’s fairly easy to buy things that are lactose or gluten free. Many Cafés and bars also have soya options available. My first thoughts of Vigo weren’t very positive. I was being sent there against my will by my university, and all I’d been told by people was that ‘it rains a lot; it’ll be just like the UK’. The UK was EXACTLY what I was trying to escape from, and have been trying to do for the past 4 years, so it’s no surprise when I turned around and told my university that I didn’t want to go! 6 months later and I was arriving in Vigo. If I’d had known then, what I know now…I would’ve put Vigo as my top choice, not my 6th! To me, it feels like a small city, but it does in fact have around 300,000 people living in it (roughly the same size as Cardiff). The main reason for it feeling so small is how open it is, despite the high rise, standard Spanish style flats. You have the sea on one side, and then the land raises up- the city going with it, until you reach Plaza España, where it drops down into houses and greenery the other side, with stunning views of the mountains beyond. The city itself has its really old area with the cute, narrow, winding streets like many cities, then it spreads out to new area with shops, shopping centres and plenty of bars and restaurants. The easiest and most likely cheapest way to get to Vigo, is to fly into Santiago de Compostela (north of Vigo) or Porto, which is in Northern Portugal with Easyjet or Ryanair. Both airports have regular services to London, which is unfortunately the only city you can currently fly from in the UK. Alternatively you can fly via Barcelona, Madrid or Paris to Vigo’s own airport, but it will probably cost you a fair amount more. From Santiago or Porto to Vigo it is really easy. Both have bus (or metro in Porto) links to the main train station, costing around €3 one way, and then there are trains and buses direct to Vigo costing approx.. €10 from Santiago and €14 from Porto. As for the weather, well... for the first 5 weeks, I saw no rain whatsoever! It was been really warm and sunny, reaching between 25 and 30 every day. After that, it did start to get a little cooler (22’c), but it has started raining. However, although this is one downside of Vigo, as it’s still warm, it’s really not that bad. I actually booked a hotel (hotel Princesa Vigo) for the first 4 nights, and decided to look for accommodation when there. It’s REALLY easy to find accommodation once here, as there is sooo much available to students, and it’s also really cheap compared to the UK. I am paying €200 a month with bills included but I know many people who are paying less than this. The best way to find accommodation is to go up to the uni and look at all the advertisements, or keep an eye on the Erasmus Facebook pages. Do not expect to buy British food here…it just won’t happen. So if you’re addicted to cheddar cheese, get someone to send you a monthly supply. 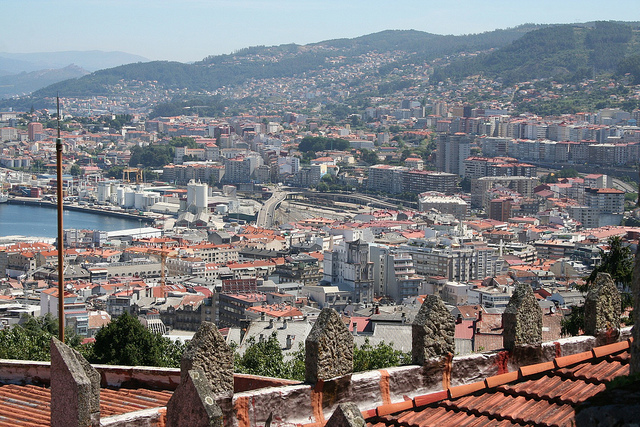 I am studying at the Universidade de Vigo at their main campus in Vigo, otherwise known as CUVI (learn this acronym!). The university is situated about 25 minutes by bus... in the mountains. Let me get one thing straight here…the scenery is STUNNING!!! The university is quite modern looking, with glass and metal, which makes seeing the views around even more stunning. The best thing though, is the ESN society! They do SOOOOOOOOOO much!!! In fact, so much, that I’ve had to bail out on a few things for fear of having no money left! Believe me though; this is such a good thing. I have made so many friends from all over the world there, and this solves the issue of not having Spanish friends…as most of the students here aren’t British, (although many do speak English), so you have to use Spanish a lot. They also run ‘chat and tapas/beer’ evenings about 5 times a week, and hold trips every other weekend, which include ‘las islas cies’, Salamanca, Madrid, Porto and loooooooooads more! 2 languages are spoken in Galicia; Castellano and Gallego. I really thought I would have a problem with the language here, especially as most of the university’s website documents appeared to only be available in Galician...but fear not! Everyone here speaks Castellano, and even on the streets, most people will be chatting in it. You will see it written almost everywhere, but, you can understand most of it as it is quite similar to Spanish. 1. Take an umbrella, you’ll need it eventually. 3. Visit ‘las islas cies’ and walk up to the lighthouse…It’s really beautiful. 4. If you are arriving on a weekend, don’t judge the town by how quiet it is… it’s lying to you! 6. Don’t live near Plaza America… it’s far from where most students end up living. 8. Get a bus card as soon as you can (when you have the uni documents), the bank who does it is very slow. 9. Buy a Spanish sim card with internet. It makes texting your new friends and surfing Facebook cheaper. 10. Let your bank know you’re abroad, otherwise they will end up blocking your card. Find out about currency cards. For the latest, check out Brooke's blog.